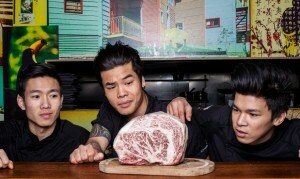 We are really excited to be able to offer Wagyu beef straight from Japan. Wagyu beef ribeye 90 g 4.990 kr. Torched tuna and fat from wagyu beef nigiri 1.590 kr. Wagyu beef is world renowned for its premium quality. What makes it special is the highly marbled texture and delicious taste. The meat we use is rated grate 5 marble ratio and is sourced from 100% fullblood Japanese Black Cattle, born and reared in Japan. The cattle have been specially raised in the beautiful area of Gunma prefecture, north west of Tokyo, using carefully selected feed, pure water and clean air. The wagyu meat is available for a short period of time. Well worth the try ….